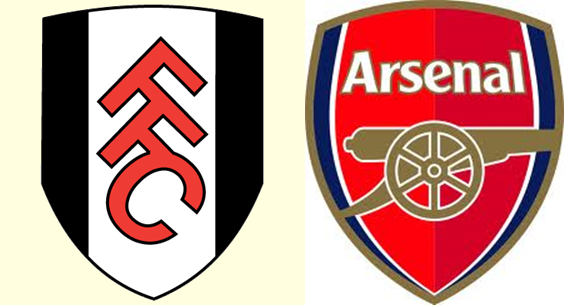 Premier League Preview for Fulham v Arsenal along with Predictions for the week 34 EPL match. Follow up each match with results and video highlights posted later in the week. You can also check out the weekly EPL TV Schedule. Arsenal come into the weekend having played one more game than both Chelsea and Tottenham following Tuesday’s 0-0 draw against Everton. They will be facing a Fulham team that is playing for pride at this point and coming off of a 0-3 loss to Chelsea. Fulham sit in 10th place on 40 points which should be more than enough to keep them in the Premier League for another season. Over their past six matches they have scored seven goals, but allowed nine. If they have any hope of getting result they will need to put in a performance like they did in their win against Tottenham a month ago. They could also look to the way that Everton set up in their midweek draw against Arsenal. Arsenal has put together an excellent run of form and gone 7-2-1 in their last 10 matches with their last loss coming in the March 3 defeat to Tottenham. They have managed to turn around a season that looked doomed to mediocrity until a month ago. They did get some good chances in their 0-0 draw to Everton, and were probably the better side, which should be a positive going in to this weekend. My prediction for Saturday’s EPL match is a 2-0 Arsenal win. Fulham are coming off of a disappointing loss and they do not have the same pressure on them as Arsenal. Arsenal look like a determined team that have the so-called bit between their teeth. It could be a closer match than 2-0, but it could just as easily be a wider gap than that. I have a hard time seeing Fulham getting anything from this game with the way they have been playing. Arsenal are desperate to get in the top four of the Premier League Table.